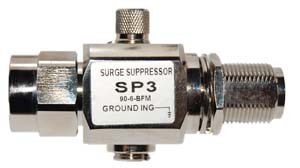 The SP3 Surge Protectors offered by Laird are an integral part of any antenna installation to protect sensitive equipment from surges caused by lightning. The ultra fast discharge design gives quick response to power surges and dumps the excess power safely to ground. Grounding is accomplished via a ground lug terminal or the N Bulkhead connector. The units have the ability to withstand multiple lightning strikes. The SP3 passes DC voltage so it is suitable for those systems which pass DC power through the coax such as remote amplifiers. Construction is all plated brass to resist corrosion. ESP-100-POE, rugged and effective surge protectors for Ethernet based systems.